I would be lying if I said this birthday cake is my first ever! But a little white lie is no harm eh!? Actually, this is my second! My first one doesn't get older than a few months, but lacked the perfect buttercream! It just wouldn't stay on the cake and had a too soft consistency! What a shame! That is why I tend to say this one is my first ever! I bet you are thousands out there who have tried making buttercream for the first time and yet have ended up with either lumpy or curdled buttercream! Today I am going to share with you a fuss-free and foolproof chocolate buttercream recipe! I have to confess though, buttercream is a very sweet frosting, if you've never had it before and do not have a sweet tooth, you might reconsider your frosting options! But but, this cake was definitely a crowd pleaser! I dare you to try it! Preheat oven to 175˚C/350˚F. Butter and flour pans. Pour the batter equally into the prepared pans. Meanwhile prepare the buttercream by first beating the butter until creamed on medium speed using the flat / K beater / paddle attachment. Add the icing sugar in 3 times, beating on medium speed. You may reduce the speed to avoid an icing sugar facial! Add 2 tablespoons of the cocoa powder at a time, until combined. Finally add the heavy cream and the vanilla extract and beat on medium high speed until combined and thick in consistency. To assemble, you can cut the top side of the cake to level it, or you can just let the top side down and flat side up on a plate or cake stand. 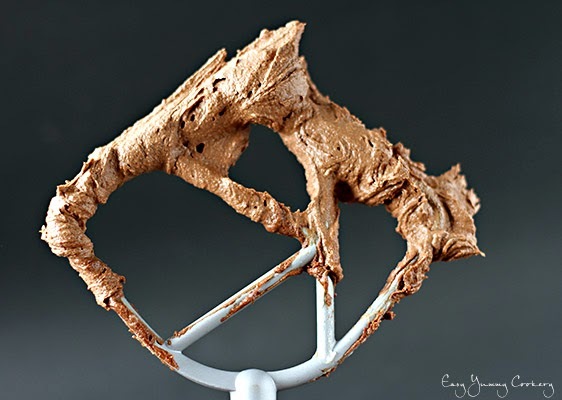 Use an offset spatula to spread an even layer of frosting. Now place the other cake on top of the frosting with the rounded side up. Cover the top and the sides of the cake with another layer of frosting. Be generous!! You can further decorate the cake with sprinkles, or coloured edible pearls or dragees! the butter is at room temperature, that is softened. If you're in any hurry or forgot let the butter soften, use the paddle attachment of your beater and beat until soft. the icing sugar and cocoa powder are sifted thoroughly. If you skip this step, you will end up with a loose and lumpy buttercream. the heavy cream, is actually not necessary, if you wish. But it helps get the buttercream to the right consistency. So feel free to adjust the amount until you reach your desired consistency. Temperature is an important factor to consider when making buttercream! If the temperature in your kitchen is too warm, your buttercream might end up slippery or soupy. What you can first do is put some cold water in a bowl with ice cubes - making an ice bath - and then plunge the buttercream bowl into the ice bath and whisk until the icing gets smooth and firm. If this doesn't work at first, refrigerate the buttercream for 30 minutes and then beat it again. If your buttercream appears to be broken or curdled like cottage cheese, the problem is once again to do with temperature! However, here it happens because the butter is too cold or its your cold kitchen! To fix a broken buttercream beat the icing on a higher speed for some minutes. If this does not work, try plunging the buttercream bowl into a bowl with lukewarm water, or wrap a warm kitchen towel at the base of the buttercream bowl. A third option is to use melted chocolate instead of the cocoa powder. For this recipe, you can use 100g of good quality chocolate. Melt the chocolate in a double boiler and allow to cool until it no longer feels warm to the touch. Fold in the melted chocolate, after beating the icing sugar with the butter, until well incorporated. You can store buttercream in a airtight container in the refrigerator for 3-5 days or in the freezer for upto 3 months. If freezing, bring to refrigerator a day before and beat again when ready to use. Voila! I give you no reason to not enjoy this delicious cake! Do you know of any other ways to save a buttercream disaster? Drop them in the comments below! ohhh cant belive its vegan...Loved it man! Such a gorgeous vegan cake, am in love with your simple and prefect frosting and decoration. How is this cake a vegan cake when the buttercream requires butter and heavy cream ? Am I missing something? Hello Zeitgeist! Sorry if you got this wrong, but I mentioned the cake is vegan and not the frosting! What wonderful cake...... Drooling here!! Lovely decorations .